Adirondack Regional Guide: Which Region Are You Interested In Visiting? The Adirondacks are a popular and scenic destination in Upstate NY. Whether you are looking for an adventure in the great outdoors or an enlightening encounter with the diverse history of the area, these communities in the Adirondacks offer endless possibilities for a family outing or solo trip. Use this guide to choose which corner of the Adirondack Park you'd like to explore. Select a region and see what towns, attractions, and businesses will be nearby for your stay. Plan a trip, and discover all that the Adirondacks have to offer! The Northern Region of the Adirondacks includes towns and villages like Jay, Keeseville, Lake Placid, Plattsburgh, and Saranac Lake. Lake George and municipalities like Bolton Landing, Chestertown, Glens Falls, Hadley, Lake Luzerne, and Warrensburg are located in the Southern Region. In the Eastern Region are places like Brant Lake, Hague, Keene, Pottersville, Schroon Lake, Ticonderoga, and the High Peaks. 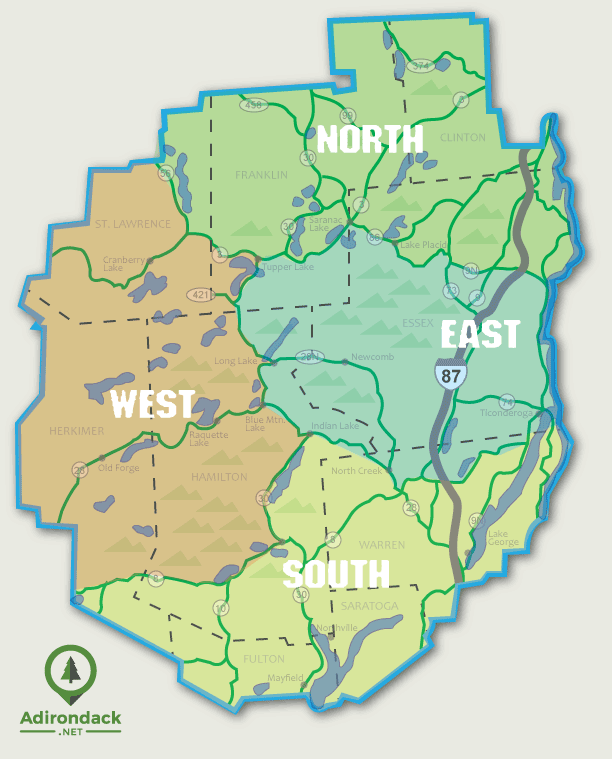 Making up the Western Region are Blue Mountain Lake, Canton, Inlet, Old Forge, Potsdam, and Tupper Lake. Nearby communities just outside of the blue line like Malone, Plattsburgh, and the Tug Hill Plateau region are great travel destinations for those who want to explore the Adirondacks and Upstate New York.